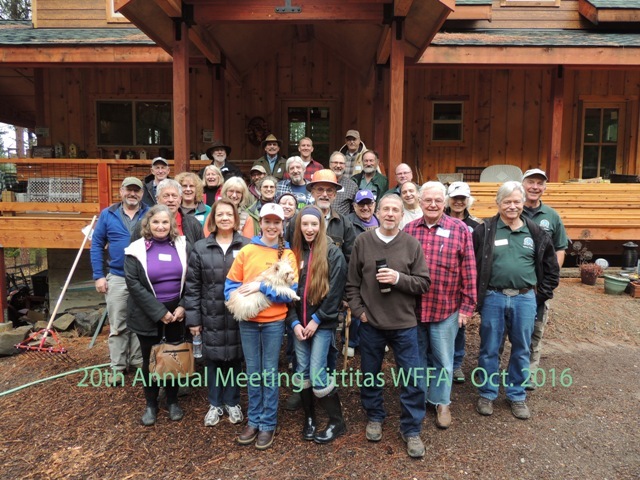 The Kittitas Chapter meets twice a year, in the Spring and the Fall. 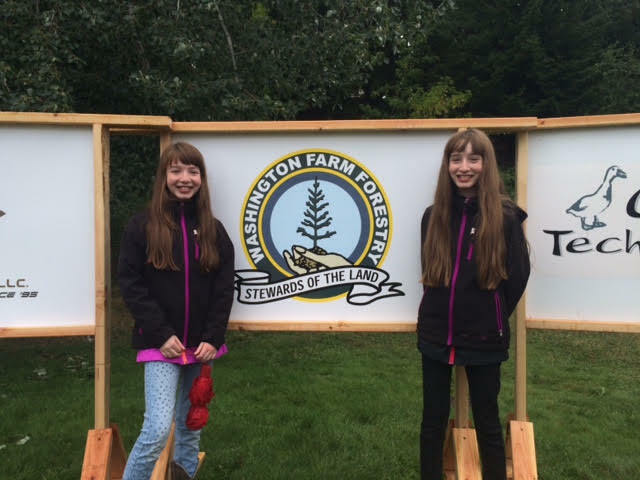 The Fall meeting is a potluck and BBQ at a member's tree farm, with a fund-raising raffle and election of officers. Please submit any news items and photos you think appropriate for our page to the above email. To renew your membership, this link will take you to a help page with information and links to the renewal form for your account. RENEW NOW. Note: Clicking on a photo in the slide show at right will allow for manual viewing. Check out this new resource from the Kittitas Fire Adapted Communities Coalition! "How is Kittitas County a fire environment?" "Living with wildfire in Kittitas County"
Will be held on Saturday May 11, 2019 in Cle Elum -- Standby for Location. Featured will be a presentation by Ryan Niemeyer - (From Omak) about the positive impacts of Forest thinning on streamflow and forest resilence to drought. Ryan is a postdoctoral researcher working with WSU and Uof Idaho and is connecting with private forest land owners to share information about his project. Scott Chambers, DNR Landowner Assistance brought us current with Cost share programs and 20 year E. WA Forest Health Plan. Carolyn Berglund from the Hidden Valley/Swauk Fire Adapted Neighborhood addressed: "What Does Fire Adapted Mean for Our Community" and K- FACC (Kittitas Fire Adapted Community Coalition). Then Rose Shriner talked to us: "Time to Get Serious about Living with Fire" and how to participate in the the Kittitas CWPP now under development. "The forest will burn -- The only decision space we have is how and when it will burn"
We have choices: If we're smart we will choose periodic mechanical thinning (commercial & pre-commercial) followed up with prescribed fire where it is practical". "The Alternative are future forests that will look nothing like what we have been enjoying for the last 60-70 years"
The value of homes across the U.S. at risk of wildfire damage is more than $1.5 trillion. Although not in the top 10, we are Included in counties with the highest risk of loss! 10,200,000 tons of CO2 from cars in 2017. Wouldn't it be fun to know this info for WA State ? 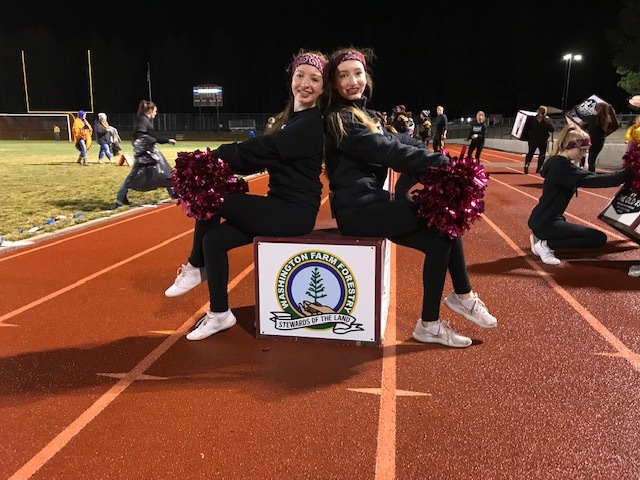 The Plan was developed by Rose Shriner at Kittitas Consevation District in collaboration with K-FACC. Rose has prepared a Summary brochure that is now available at several locations or you can find it on the Kittita Conservation District website. Lynnea Thibodaux organized the chapter polo shirt/vest project and we are now taking orders. See photo in slide show at the right. To place and order contact us at [email protected]. These are high qualtiy cotton-polyester shirts that come in women and men sizes. Silvaseed Nursery in Roy, WA is looking for someone to set up a cone buying station for our seed zone. This would be for DF, PP and WL. We are having a good DF cone crop this year. Cone buyers get paid a commission and organize cone collectors. For more details contact us at [email protected] or call Mike Gerdes at Silvaseed: 253-843-2246 --- We are seed zone 631. Note: It appears we are having a outstanding Douglas Fir cone crop in 2018. The Nature Conservancy (TNC) is one of the larger landowners in Kittitas and Yakima Counties Click on the link here to see the latest from TNC: http://www.washingtonnature.org/centralcascades The TNC office in Cle Elum is at 110 East First St. Darcy Batura is the local TNC Community contact person. Darcy can be reached at 509-852-2508. What is Tapash? Tapash was established in 2007 between major government and tribal landowner agencies in the eastern Cascades of south-central Washington: including USFS, Yakama Nation, WA DNR, WA DFW, and TNC. The Collaborative provides a framework for cooperation and coordination to restore forest resistance & resilence to wildfire and insect and disease attacks to 1.6 million acres. There are three ongoing restoration projects: Little Naches, Oak Creek, and the latest is Manastash-Taneum. These projects include tree thinning and prescribed burning contributing to wood supply and fire risk reduction. A good source of Native Trees & Shrubs are available from WA Conservation District Nursery. For details click here. Another good source is Derby Canyon Native Plants in Peshastin. Google Derby Canyon Native plants for their excellent website. Thank-you all for renewing your membership ! We have 70 family and individual forest owners, forest contractors and others that share our values and interest in family forestry. Thank-you all for your continuing support! Our Chapter membership represents approximately 8,500 acres. WFFA Signs - if you do not have a WFFA sign or want another, send an email to the above chapter email. One of our members is using goat grazing for managing vegetaion in a shaded fuel break. See in slide show at the right. This is in a area where there is no usual livestock grazing. Contact us for more details [email protected]. Bill Hall has figured out a creative method for planting styro #10 PP plug seedlings on tough/rocky ground. He is using a cordless drill with a 1/14" Irwin Speedbore twist drill. Bill says it works great and a lot easier than a planting shovel or bar. For more details See Bill's technique. For browse protection he uses a 2' Max Grow tube installed with a 2', 1/2" PVC stake pounded into the ground with a 1/2", 3' steel bar driver with a head on one end for driving in the PVC stake. Pretty clever Bill! As of 2017 after 4 years, Bill reports about 50% survival which is good for this tough site. Several of our members are conducting forest health and FireWise fuels reduction projects this summer. This means commercial and pre-commercial thinning, ladder fuel pruning, slash disposal and log sales. See Examples in the slide show. Factoid - Kittitas County is 61% forested. There are 914,469 forested acres, mostly federal and state. There are 2,600 family forest owners representing 58,000 forest acres (source: UW State Forestland Database, 2007). LOG MARKETS - There is a local place to sell your logs: Western Wood LLc has a log yard near Cle Elum. For information and log prices contact John Tortorelli at 206-310-2599 or Michelle Zaun at 360-825-1342. The majority of the logs on every load must be cut to the preferred 38' length. 8" is miimum top diameter. Willis Enterprises chip mill at Bullfrog (I-90 exit 80) is buying small logs. This is a big plus for those of us that are generating small logs from forest health and fuels reduction harvest entries. Remember: To harvest trees you need a FPA (Forest Practices Application) from WA DNR. It is advisable to have an active FPA to take advantage of fluctuations in log prices and contractor availability. A Long Term Application (LTA) is recommended. A LTA is good for 15 years vs the standard 3 year FPA. FPA exceptions are: 5000 BF per year for personal use on the property and trees within a tree length and one-half of a structure. The new biofuels plant in Lakeview Oregon is expected to convert 136,000 tons of woody biomass and forest by products in 15 million gallons of renewable fuels annualy !!! Forest BioMass is also being used for generating electricity! A 25 MW plant requires 40 chip van loads per day. 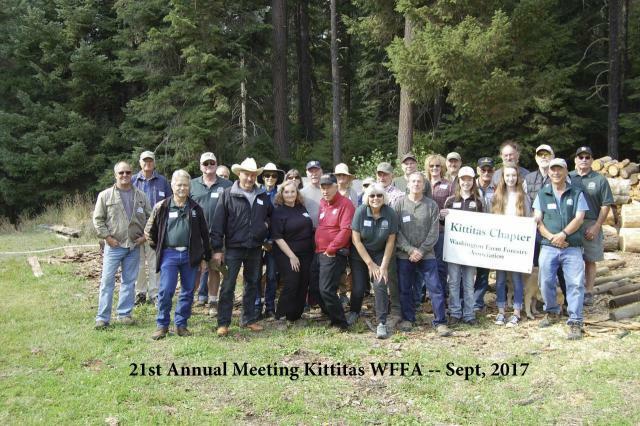 Learn more about the benefits of joining Kittitas Chapter. We love our trees !